You can hear without listening, but you can also talk without communicating. Just because words are being spoken doesn’t mean they’re being understood. 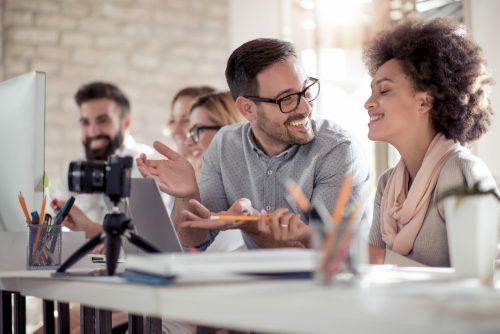 Whether you’re a gold-star conversationalist, or an outspoken chatterbox, these tips on how to improve communication could help in all areas of your life; all the way from family discussions to high-level boardroom meetings. Half of conversation is listening. It has to be, otherwise there are just two people talking to themselves in close proximity to one another. Before giving your own opinion, take a moment to make sure that you’ve correctly listened and understood what the other person is saying. Showing that you’ve listened to what the other person has said will help to create a connection between you. If they know that you’ve been receptive to what they’ve said, they’re far more likely to pay attention to what you have to say in reply. Comments like, “I know what you mean”, and “that’s a great point”, can go a long way to doing this. When some people listen, they do so only in order to pick holes in what the other person is saying. Whether or not you agree with what is being said, try to see what is being said from the other person’s perspective, and then use that new understanding to move the discussion forward in a positive direction. Don’t listen and then talk in order to prove someone wrong – listen in the hope of to learning something new or seeing a new perspective. How To Get Through a Panic AttackWhat Will Your Future Job Be?